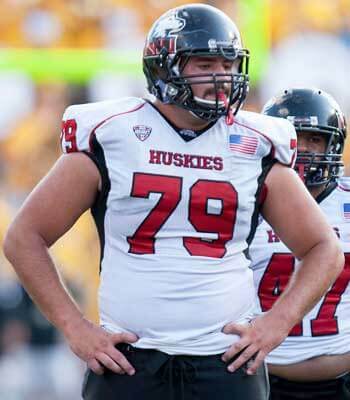 Northern Illinois offensive tackle Matt Krempel (Columbus, Ind./Columbus North HS) has been named one of 170 candidates for the 2013 National Football Foundation (NFF) National Scholar-Athlete Awards, presented by Fidelity Investments. With the nomination, Krempel is also a semifinalist for the 2013 William V. Campbell Trophy, endowed by HealthSouth, which recognizes one individual (from any level of college football) as the top scholar-athlete in the nation. While there are 170 candidates for the NFF Scholar-Athlete Awards and Campbell Trophy, NIU’s Krempel is one of only 54 nominees from the Football Bowl Subdivision this year and one of only four nominees from the Mid-American Conference. Each college football playing institution is limited to one nominee, and that individual must be a senior with an undergraduate grade point average of 3.2 or higher, outstanding ability as a first-team player or significant contributor and have demonstrated strong leadership and citizenship. According to NIU head coach Rod Carey, who spent the last two seasons as Krempel’s position coach, the senior fits all the criteria. Krempel is a three-year letterwinner at offensive tackle for the Huskies who has shared the starting right tackle position over the last two seasons. 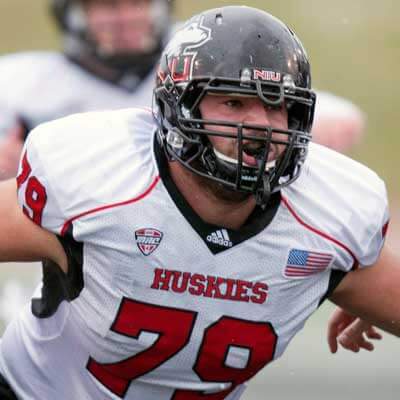 He has played offensive line on some of the most successful teams, and most successful offenses, in the history of Northern Illinois University as NIU has won 11-or-more games in each of the last three seasons. A year ago, the Huskies ranked 15th in the country in total offense and gained at least 500 yards of offense in seven games while allowing just 1.2 sacks per game. NIU won its second consecutive Mid-American Conference Championship en route to earning the MAC’s first spot in a Bowl Championship Series (BCS) bowl game. In the classroom, Krempel earned his undergraduate degree in pre-physical therapy in May 2012 with a GPA of 3.59. He is currently pursuing a master’s degree in kinesiology and physical education at NIU while completing applications for physical therapy school. Krempel is a member of NIU’s Leadership Council and is very involved with the local “Best Buddies” program which pairs individuals with developmentally challenged adults. The NFF Awards Committee will select up to 16 recipients for the NFF Scholar-Athlete Award and those individuals will be finalists for the Campbell Trophy. Scholar-Athlete Award winners each receive an $18,000 postgraduate scholarship and will travel to New York City on December 10 where they will be honored during the NFF Annual Awards Dinner at the Waldorf-Astoria, and one member of the class will be announced live as the winner of the William V. Campbell Trophy. NIU is the only school in the country to have had a player earn an NFF Scholar-Athlete Award in each of the last two years. A year ago, Huskie defensive lineman Nabal Jefferson (Chicago, Ill./Marist HS) earned the prestigious honor, following in the footsteps of 2011 honoree Chandler Harnish (Bluffton, Ind./Norwell HS). Krempel and his NIU teammates take their 4-0 record and No. 23 ranking in the USA Today Coaches Poll to Kent State University Saturday, Oct. 5, for their 2013 Mid-American Conference opener. The game is a rematch of last year’s MAC Championship game won by the Huskies in double overtime. NIU returns to Huskie Stadium Saturday, Oct. 12, for a Homecoming match-up against Akron. Tickets for the Homecoming game and all four remaining NIU home games are on sale at NIUHuskies.com/tickets or by calling 815-753-PACK (7225).